President Putin met with Russian Government members. 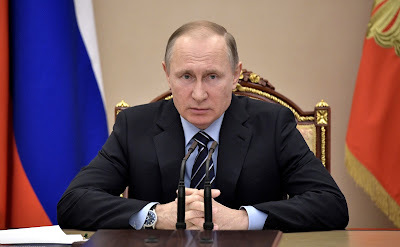 Putin.BLOG Government President Putin met with Russian Government members. 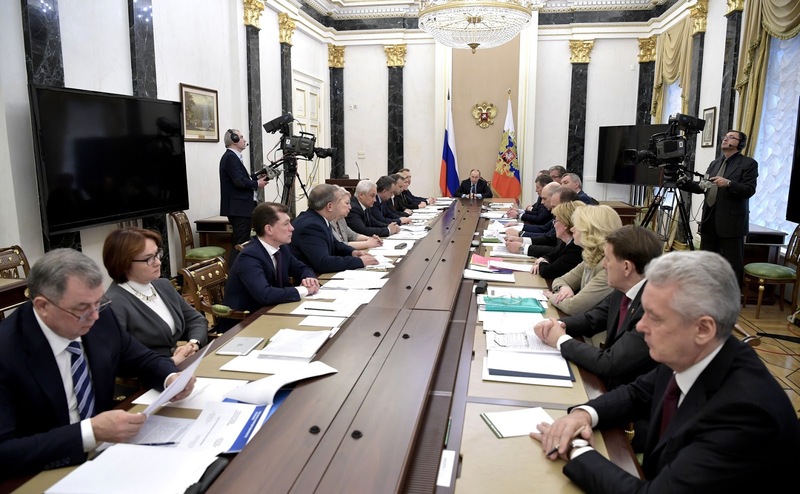 Vladimir Putin held a meeting with Government members in the Kremlin. 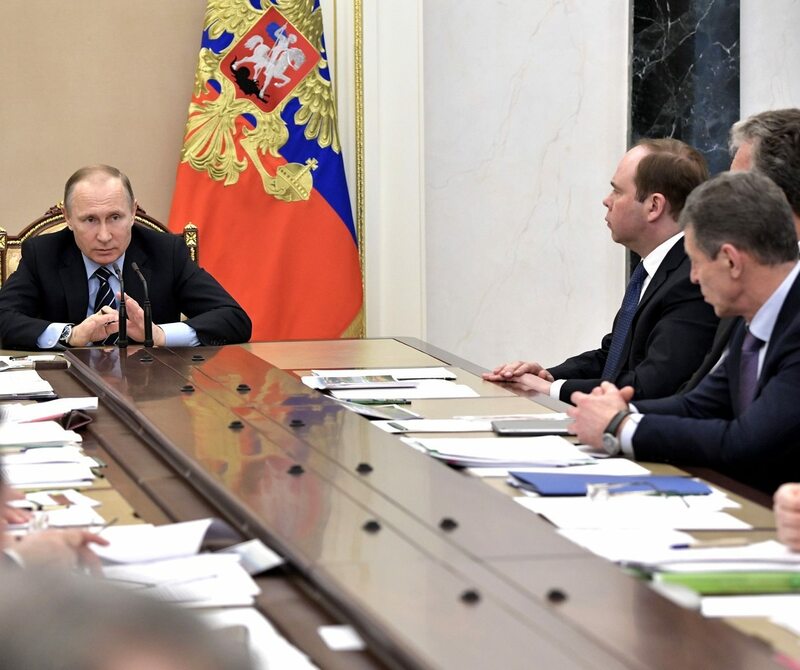 Vladimir Putin had a meeting with Russian Government members. We will begin with s number of current issues. The epidemic level seems to be on the decline, but the situation is still serious. Even Mr. Medvedev could not stay out of harm's way, and caught the bug. Ms. Skvortsova, please tell us what is happening; what is being done to fight these diseases, the flu, and what are the prospects, including in terms of vaccinations. Go ahead, please. We have begun preparations for this flu season in March 2016, once the World Health Organization provided information on this year’s vaccine strains. From April to August, Russian manufacturers produced four highly effective and safe vaccines. This has helped us significantly increase the scope of government-funded vaccinations this year, to 56 million people, or more than 38 percent of the population. In 2011, it was only 26 percent. In addition, over the last two years we have introduced a combined flu and pneumococcal vaccine for high-risk groups. The flu rate has dropped 3.6 times with these efforts over a five-year period, and the occurrence of complications and severe forms of influenza declined significantly. This season, the flu outbreak started in autumn and peaked in late December, when the WHO said that the flu outbreak in Russia was moderate. It is important to note that from all the flu cases confirmed by laboratory tests, only 4 percent occurred in people that were vaccinated, while the other 96 percent did not get vaccinated. The influenza related mortality rate decreased by 20 times this season compared to the previous year and two years ago despite the fact that there was an outbreak this year. The actual mortality rate was equal to 0.3 per thousand people. This is one of the lowest indicators worldwide and for Russia as well. As I mentioned, the number of patients with flu complications also went down. Influenza is currently receding. Only five regions are now above the epidemic threshold: two in the Central Federal District and three in the Siberian Federal District, down from 17 regions a week ago. The flu strain has changed, which is also an important indicator with the epidemic strain currently at less than 15 percent. The flu we are seeing now is mostly type B. All forecasts show that the flu will disappear in the second half of April. Let me note that on March 2, the WHO announced the recommended composition for vaccines for next year, and a special commission at the Healthcare Ministry approved them. We will start working on the vaccine for next season soon. Hopefully, we will be able to keep up the positive momentum. Good. What about the demographics? We have preliminary demographic data from Rosstat, Mr. President. We can say that the indicators, as determined by the general state of health for the population, have improved. According to preliminary data, the life expectancy rate has increased by six months to 72 years: over 77 years for women, and 66.6 years for men. Primarily, this is a reflection of a decrease in the mortality rate across all age groups. We had 17,500 fewer deaths in 2016 than in 2015. Importantly, the maternal mortality rate decreased by 18 percent in one year to an unprecedented, ​​for our country, 8.3 per 100,000 births. In 2011, this number stood at 16.2, meaning that in five years there was a 48-percent decrease. The infant mortality rate also dropped by 8 percent to 6 per 1,000 live births as of the year end, and it was already 5.1 in January. Again, the infant mortality is down by more than 40 percent in five years. Today, in 56 of 85 regions the infant mortality rate is below 5 which is on a par with the best international indices. Overall, mortality rates for children under 18 fell by 8.5 percent, and by more than 30 percent for the five-year period. For the working age population this number is down by 3.5 percent for the year and over 10 percent for five years. In people over working age, it’s down 0.8 percent for this year and, accordingly, down 5.5 percent for the past five years. Thus, in general, the mortality rate across all age groups has declined. However, the demographic makeup of the population is changing, and the number of people older than working age has increased 2.5 percent in just one year, now standing at 24.5 percent. As a result, the overall mortality rate also dropped, but not as drastically as in individual age groups, by 0.9 percent. I would also like to note, Mr. President, that apart from mortality rates, there is an important integral indicator, which is the duration of a healthy life, that is, life not burdened by chronic disease or disability. Over the past decade, this indicator has increased by 4.5 years: by 5.5 years for men and 3.5 years for women, and was as high as 62 years as of early 2016 according to 2015 data. This year, the indicators will come in a little later, but we are confident that these numbers will improve as well. And the last thing I wanted to say is that healthcare is helping to keep the birth rate at high levels in two ways. One is the prevention of abortions. I would like to say that over the past five years we created a network of 1,500 pregnancy assistance rooms and centers at maternity welfare centers and maternity homes. They provide social and psychological support to pregnant women in a difficult situation. Thanks to this, the number of abortions decreased by 8 percent or 58,500 cases in one year and by 25 percent or 247,500 cases in five years. Besides, we have made great progress in terms of reproductive health and reproductive potential. In 2013, in vitro fertilization (IVF) was added to the list of services covered by mandatory medical insurance, and couples who could not conceive now receive that medical treatment free of charge. In 2016, the number of couples who received free IVF treatment reached 47,500. We expect the figure to increase to 62,000 in 2017. We are not just increasing the number of such procedures but also their effectiveness. The overall effectiveness figure for the country is above 30 percent, which means that every third cycle results in pregnancy. We are now planning to reduce the death rate and increase the birth rate. The State Statistics Service will publish the figures for last year on July 2. Good. I see that the death rate has been on the decline for all the main groups of diseases. The best achievement has been reported for tuberculosis, down 16.7 percent, and the smallest achievement for malignant tumors, a decrease of 0.8 percent. What I mean is that there is still much to be done. You should know this. Actually, you know this. As for record-low infant and maternal mortality rates, it is a very good achievement. But this is something we must never lose focus of. The situation can deteriorate quickly if we so much as look away for a minute. Therefore, I hope that you will keep this in mind when organizing your work. Thank you. We had a very cold and snowy winter in many regions of the country. Now the situation is changing fast. Spring is taking over. Are we ready for spring floods, on the one hand, and wild fires, on the other? Mr. President, colleagues, currently the situation with spring floods is developing as expected. It may be more complicated in southern Siberia and several more regions, including the Far East. We can see a significantly higher amount of snow and ice on the water. The early spring is prompting the agencies of the Unified State System for Emergency Prevention and Relief to take an entire range of advance action. Currently, in five Russian regions seven low-level bridges and several lowland areas are flooded. Regional authorities are taking measures to provide all vital support to residents, ensure vehicle access to towns and villages, and create necessary reserves of food and medical supplies in those areas that are expected to be cut off during the spring flooding season. The Unified State System for Emergency Prevention and Relief has established a powerful group of forces involving over 700,000 personnel and 160,000 units of equipment. Federal aviation includes 155 aircraft and helicopters fitted with all necessary technology and resources. We plan to conduct additional training and drills to improve cooperation with ground-based services protecting residential areas from flooding. We discussed this recently at a Security Council meeting and noticed that you are not going to involve the equipment and aircraft of several agencies. For example, those of the Defense Ministry. You promised to reconsider this decision. Mr. President, we did look into these issues. The fleet of the Emergencies Ministry, the Ministry of Defense and the National Guard, as well as the Federal Security Service’s border troops, will be involved in protecting residential areas and vital economic facilities. Additionally, we have planned more joint drills and training for crews in extreme conditions. This task will be fulfilled. With regard to tightening control over the hydraulic facilities’ operation, we have established, in conjunction with our federal agencies and regional authorities, additional control over 3,500 hydraulic facilities, including ownerless ones, and figured out their respective work schedules. Additional task forces will be deployed at the most unsafe sections of hydraulic facilities and dams. In addition, 13,500 rapid-response airborne units are on high alert, 560 congestion-prone areas are being monitored, and 160 demolition specialist teams stand ready for action. During the spring high water season, we focus on ensuring sustainable operation of all social services, such as availability of medical services and rapid response to fires and emergency situations. We also arrange makeshift crossings, including for taking children to and from schools. The spring flood schedule has been drawn up, and all the force regrouping projects have been reviewed. Based on flood conditions, we plan to reinforce our units in northwestern Volga regions and the Urals in March-April, and the Russian Far East in May-June. All life support activities during the spring flood are sponsored by the National Crisis Management Centre. Fifteen wildfires have been extinguished this year already in the Krasnodar Territory, the Primorye Territory, and the Republic of Crimea. All fires were put out on the same day they erupted. In order to carry out the array of tasks involved in protecting communities and social infrastructure, a powerful task force has been formed, which allows us to fulfil all the tasks at hand. Russian Government has drafted amendments to legislative and other regulatory acts. We are now engaged in putting together effective mechanisms for their implementation on the ground. Supervisory bodies, the Emergencies Ministry, the Ministry of Natural Resources, and the Ministry of Agriculture joined forces and closely monitor the implementation of measures to prevent wildfires, and to provide rapid response when they break out. Over 10,000 mobile operational groups have been formed, which allow us to respond to complicated fires. A space monitoring system for heat points is being developed, and we have made provisions for all the necessary information to be made available directly to local authorities. The technical supervision system, Forest Watch, as well as other systems are being actively developed, and make it possible to monitor the state of forests, to focus on protected areas, game reserves, nature reserves, and of course, to organize interaction with agricultural producers. The action plan has been drafted. I’m here to report that the emergency response task force is ready for its mission and will respond promptly and take all the necessary steps as the spring flood and wildfire situation unfolds. Our top priority is, of course, unconditional protection of human lives and rebuilding, in the shortest possible time, the social infrastructure. This concludes my report. Good. I look forward to your forces functioning reliably. Our entire transport system is preparing for spring and summer traffic season. I am referring to air, railway, river, and sea transport. How is this work going, including the provision of transport for passengers entitled to reduced fares? The entire transport infrastructure is making standard preparations for peak passenger traffic this spring and summer. I'll start with one concrete question, namely, free transit for WWII veterans and disabled veterans in May 2017. Our major companies, Aeroflot and Russian Railways, have traditionally provided free travel arrangements for WWII veterans and disabled veterans. With regard to air transport, free air travel in economy class on all domestic flights will be granted during the first two weeks of May. Upgrades will be possible based on seat availability. Of course, such upgrades will be provided to Heroes of the Soviet Union and full knights of the Order of Glory. Moreover, each participating veteran will be entitled to a free ticket for an accompanying person. In addition to domestic flights, WWII veterans and accompanying persons will be able to fly to the CIS countries, the Baltics, and Georgia, as well as from all the countries of the former Soviet Union to certain European countries, namely, Bulgaria, Hungary, Germany, Poland, Romania, Serbia, Croatia, Austria and the Czech Republic. Tickets will be available beginning April 25 and remain valid for one month. With regard to Russian Railways, free travel across Russia in compartment cars and cars equipped with seats for long-distance rides will be accorded to all WWII veterans and disabled veterans, as well as accompanying persons, also during the first several days of May. These tickets will be available beginning tomorrow, March 15. All issues related to transporting our citizens will be monitored by all Russian Railways employees. Our veterans and disabled veterans, several thousand people in all, use these entitlements every year to travel across Russia and to other countries in order to participate in celebrations dedicated to Victory in 1941–1945 Great Patriotic War, and to meet with their fellow soldiers and friends. I would also like to report on measures to ensure transport for Russians who are entitled to benefits. In terms of air transport, in summer we pay special attention to southern destinations, including Crimea and the Black Sea coast of the Caucasus. Reduced fare tickets to fly to Crimea will go on sale starting May 15 this year compared to June 1 last year, which means the discount period has been extended. Three destinations ‒ Orsk, Syktyvkar and Sochi ‒ have been added to a total of 61. There are 475 million rubles earmarked for this purpose. The fly-to-Kaliningrad program was extended as well. Moscow and St Petersburg, which were already part of the program, are joined by four more departure cities: Murmansk, Arkhangelsk, Yekaterinburg and Sochi. Tickets will go on sale on May 15 as well. The funding stands at 370 million rubles. Finally, there is the Far Eastern Federal District flight program. It is another important region for us, which now offers three more flights – from Krasnoyarsk, or the Siberian District, to Blagoveshchensk and Khabarovsk in the Far Eastern District, and to Irkutsk in the Siberian District. The first flights will take off on April 1, and 3 billion rubles were set aside for this in 2017. A total of 3.5 billion rubles have been allocated for this kind of passenger transport, including for 124 destinations, and 25 destinations to areas of tourism and recreation. It is both social support as well as a special emphasis on tourism and on increasing passenger traffic to Russia’s major tourist areas. As for rail, on the whole this year we expect an increase in ridership both in long-distance rail travel, where we project a slight rise of 1–2 percent, and in suburban travel, where we expect a surge of nearly 10 percent. The latter is first of all the Moscow Region, including all tourist destinations there. In summer, the most popular itineraries are, of course, to the southern parts of our country. In summer, there are plans to provide over 400 additional trains from Russian regions – from about 20 cities, as last year – to resorts in Crimea, the Krasnodar Territory and the Black Sea coast in the Caucasus. In addition, about 500,000 children will be travelling. They are a special category. Naturally, families try to go with their little children or send them to health resorts as part of tourist groups. There will be over 200 special trains for children (this is a special program operated by Russian Railways), including 28 special trains with new cars. However, Russian Railways generally seeks to use only new cars to carry children, which are equipped with climate systems and bio toilets. These cars are equipped with safety belts on the upper bunks to prevent children from falling down. All of these routes are specially tracked in information systems, making it possible to respond to any problems without delay. A special feature this year will be subsidized travel not only in open coupes but also in compartment cars, so that families with children can reach their destinations as comfortably as possible. We have continued the unified all-transport ticket program for our citizens, families going to Crimea. These tickets are already available and several hundred have already been purchased under this program. Russian Railways continues to develop the tourist component of its activity. A special company, RZhD Tour, provides weekend tours to cities such as Veliky Ustyug and Kostroma (in winter). In summer, such programs will also be available in cities where summer programs are available. Also, there is a special program for foreign visitors, above all from China. The itinerary from China across Siberian and Ural regions is becoming increasingly popular with them. Last year, several thousand people travelled this way. This year the program will be expanded. Now let us talk about improving inter-budgetary relations and share our views on the issue we have met to discuss. President had a meeting with Russian Government members in Kremlin. 0 Comment to "President Putin met with Russian Government members."